Your dog will have a strong association with the lead going on, going through the doorways and exiting the home, as these are all early signals of the walk itself. Once outside, your dog will be exposed to a mass of sensory input so you can imagine the effect this will have on your dog. It's your job to guide the dog's uncontrolled excitement into more manageable and calm behaviour. The trick to attaining this is to break things down into bite-size pieces. Firstly, your dog will need to be calm and exercising a good degree of self-control before you place the lead on him. If over the first week you have to wait an additional five minutes before your dog is calm enough to place the lead on, then this is what you will need to do! Calm behaviour on the dog's part results in progress…excitable behaviour results in no progress! Now we need to move to the door you leave the house by. Once you move off with the lead on, do not allow your dog to drag you through the home. Stop, walk back a few paces and then slacken the lead. Wait a few seconds and then progress again ensuring your dog is calm before moving off again. Repeat this until your dog can walk with you in an attentive and relaxed manner as you approach the door. Once at the door, place one hand on the handle, and the other should be holding the slack lead. I prefer not to say anything at this point, as the dog will learn better by its own learning process - rather than you issuing a stream of commands. What you need to now do is to repeatedly open and close this door (only an inch or two to start with) until your dog is standing back – looking at you as if to say, "Ok, I give up…after you!" Every time your dog goes to either rush the doorway, claw at the door, or use its nose to force the door open, you will close the door in front of the dog. Do be careful not to knock his face with the door, most dogs see the door closing and step back. Once your dog is showing clear signs of standing away from the door, this is your chance to open the door more each time until you are able to step over the threshold (slowly go out backwards so you can block the dog again if needed). Count to five once you are outside looking back at him with a slack lead between you, and then invite him on with a bright call. So, you should now have a much calmer dog than you have been experiencing. Be sure to take your time and to control each step. As you move down your pathway to the road for example, you will need to stop each and every time he pulls and bring him back a few paces and then to offer slack on the lead again. You are telling him at this point that you will only progress a) when you say so, and b) when he is calm on a slack lead. Once you are onto the pavement area, you can begin to practice your heelwork. You are in a corrective zone with him at this point, so again, each time you move off with him using a bright voice you will I expect find that he resorts to rushing ahead. This time when he is ahead of you I want you to stop still immediately, at which point he will continue forwards and come to an abrupt halt. At the same time you stop, turn and walk away in the opposite direction (180 degrees) without waiting for him or encouraging him to follow you. When you find him coming alongside you, be sure to reward him with your bright pleased voice, catch his eye as you walk and smile to show your pleasure. I find that many people simply don't communicate enough with their dog when on the lead, and so the dog looses interest in the owner and then pulls ahead to fresh scent. When again you find him in front you should stop and change direction as before. This simple method of changing direction when he is in front, and rewarding him verbally when alongside works very well with most dogs, so stick with it and practice daily. You can begin to extend the length of your walks as he begins to walk to heel as you would like. 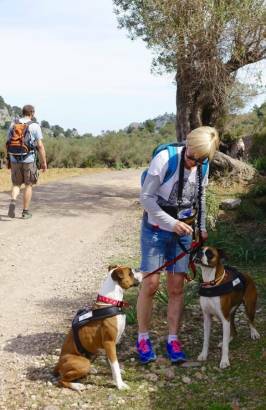 If for example you have been clicker training your dog, or you know he is well driven by food, then by all means introduce such lures to establish the position you would like him to be in as you walk along together. The combination of general leadership (seek out my other article on this subject) controlled exit from the home and the above technique can make an immense improvement in a matter of hours with practice. I recognise that there is not a 'one size fits all' method, but the above is my standard procedure due to its success rate and speed of change in the dog. If you continue to experience problems in this area please contact me directly.